Below, you will find the first story I put together for the challenge. I wanted to update everybody on the plan for subsequent stories. Every new story will be posted here for a week totally free. Following that it will be available as an excerpt only. If you want to read the whole story you can purchase it on Kindle, Smashwords, and the Nook. THE CLASH OF STEEL ON STEEL rang out across the weathered courtyard, drawing a small crowd of servants and hired workers. The two men were moving about the open space, dancing and shuffling about while parrying and thrusting swords in furious motions. 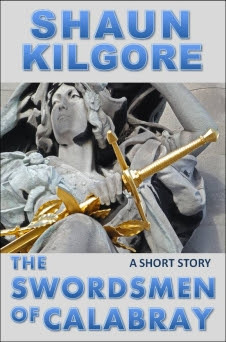 The crowd looked on in rapt silence, hardly another sound disturbed the court but the rhythmic clatter of the blades and the grunts and cries of the men engaged in swordplay. The steel glinted in the midmorning sun, shimmering with sparkling patterns that dazzled the eyes. One swordsman struck hard and fast, crashing bodily into the other drawing the blades together, entwining them, and pulling closer to his opponent. Heaving and sweating, the men are now face to face, only inches apart. "Do you yield, Donataldo?" asked the one swordsman, his crimson jacket undone in the front, his blonde hair darkened and sticking to his forehead. Those sparking blue eyes of his held no shortage of amusement. "I would ask the same of you, Kenroy." "Ha! On that point you would be sorely mistaken!" Kenroy shoved Donataldo away from him, swiping at him in the process. Donataldo cursed and barely managed to dance back as the sword's razor edge ripped through the air instead of his gut. He returned the gesture with a swipe of his own, though it was more for show than anything else. It gave him time to regroup and ready another offense. He wove back and forth across the cobblestones of the square, striking Kenroy's blade with practiced motions, a pattern of lethal maneuvers that quickly had the man on the defensive, backing away while he tried to regain his footing. Donataldo pressed harder, landing stronger blows, then dancing back to allow Kenroy at least one strike before he launched another series of heavy-handed blows. Neither man noticed the new arrival, but servants and day laborers alike drifted back to other occupations while a blue-cloaked man and the small complement of soldiers watched them fight. Donataldo charged Kenroy, but the other man feigned a retreat but managing to put down his attack and shove him. The redheaded Donataldo skidded to the ground, nearly slamming his face into the hard stones and putting a sizeable rip in his black coat. He spun around, struggling to retain his grip on his blade, but there was Kenroy, standing over him, blade pointed straight at his chest. Gods the man was smug. "Fine, fine, you got me. I yield." Kenroy's laughter was loud. He held out a gloved hand. Donataldo took it and Kenroy pulled him to the ground. "See. I told you I would get you this time. Ha! You should have seen you face, Donataldo. It was worth a purse of gold, I tell you. A whole purse, by Risha." At that moment, the blue-cloaked man started clapping. Both swordsmen turned. It was then they realized they had the whole court to themselves. Their lone observer doffed his broad, velvet hat, bowing with a flourished. "Well done, friends. A fine match, indeed." Donataldo frowned at his honey-tongued tones. The man certainly liked the sound of his own voice. He also weighed the presence of the soldiers. They were likely a bodyguard attachment. He glanced at Kenroy who just shrugged his shoulders. "And who might you be, sir? It seems you've chased off our usual audience. It's a shame because they do love to be entertained. What, may I ask, brings you to our humble little hamlet?" The man donned his hat and adjusted his fine-cut cloak with another flourish. He wanted them to see his finery. The man was a snob, Donataldo decided. Kenroy could barely restrain his laughter. "You are Donataldo of Benobell, are you not? And your companion here is Kenroy of Shenbatan?" Donataldo acknowledged the man's question with a single flourish of his sword. Then he slid it back in the scabbard. "And you? It seems you know my name but can't say that I know yours. Do please put an end to my ignorance." Kenroy slides his blade home noisily. "Yeah, I'd like to know it too, if you please. Not sure whether you're hear to offer me a job or collect on my outstanding debts. One could hope it's the former rather than the latter." "Please, gentlemen, I am here because I need your assistance. Your reputation, being what it is, I could not pass up the chance to speak with you. I have a matter which needs a careful hand and one that requires skills such as yours." "Oh, right, excuse me. I am Akirian, high warden of Calabray." "Calabray," said Kenroy. "What, by Risha, are you doing here in Dentanty? You're a fifty leagues and more away from home." Akirian nodded. "It is as you say. Your reputation—both yours and Master Donataldo's—has reached the ears of men I know and trust. They gave me enough information that I felt the journey worth it. Of course, I did not know I would be tracking you through ten different cities and villages. I was informed that you both were resided in Egandare." "We had a bit of a problem in Egandare," said Donataldo. Akirian smirked. "Indeed you did. The guards of the Lady Deiara were tied to the city walls for failing to protect the virtue of her ladyship." Kenroy's face went red. "Now, it wasn't like that at all. I had no idea she was one of them cloistered women. She seemed willing and ready to me when I thrashed that cutpurse who was trying to steal her coins. She was very thankful, I must say." Akirian cleared his throat. "Well, that aside, I managed to miss the both of you at each stop...most often by barely a day." Donataldo walked closer to where the warden was standing, eying his guards briefly. They made no move. "We decided it would better to put a certain amount of distance between us and Lord Fendrake and good people of Egandare." He pointed towards the Dancing Fox, Dentanty's smallish tavern. "Let's go discuss this problem of yours over a mug of beer."